If you've filed bankruptcy, you know it's not the end of the world. In fact, for many people it's the start of a brighter financial future that will help them finally reach their dreams. While bankruptcy is the first step in re-establishing good credit, you can't just file a case and expect significant movement. You've got to work at it. It's going to take some attention, and it's going to take time, but it can be done. Credit scores are based on data collected over a period of months and years. 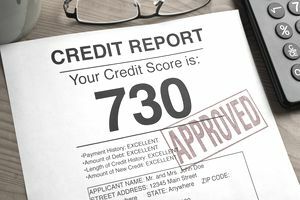 One month or even six months of data may not be enough for the credit scoring company to produce a score that will net you the best credit terms. But maybe a year or two of data will. Here's how you'll get there. . . .
Bankruptcy does not necessarily eliminate all debt. Some loans, especially those that are secured, can survive the bankruptcy because the lender is entitled to at least the value of the collateral. These are commonly known as reaffirmations. Normally, a reaffirmation survives the bankruptcy with the same terms the loan had going in. Therefore, if you have a car loan when you file a Chapter 7 and you want to keep the car, you will continue making the payments as spelled out in the loan documents. Because this debt is reaffirmed, or not discharged, the lender will continue to report the debt and your treatment of the debt each month to the credit reporting agencies. Reaffirmations can go a long way toward rebuilding a credit score. But, they only work if you make the payments on time. With a secured credit card, you deposit with the lender an amount equal or nearly equal to the maximum credit line on the card. If you stop making payments, the lender can keep the deposit to make up for what you didn't pay. Many people see this is as not much different from using their bank accounts and a debit card since they still have to put an amount on deposit. But there are some very important differences. On the negative side: the fees you'll pay for the privilege. Usually, the lender will charge an annual fee, perhaps an administrative fee for the set up of the account, and a high annual percentage rate. Since those fees are usually changed directly to the account, and because credit limits on secured cards are usually low - $300 to $500 to start, you could easily find with your first statement that half of your credit availability has gone toward covering fees. On the plus side: your payment history for the secured card will be reported to the credit reporting agencies. This is not true of your debit card activity. On your credit report, the secured card will look like any other account. If you pay according to the terms of the account, your credit score will rise. If you fail to pay according to terms, the credit score will fall. In our area, car dealerships actively market to people who have recently emerged from bankruptcy. A few short months after receiving their discharge, many of my clients will begin receiving letters from dealerships offering to help them re-establish credit through the purchase of a vehicle on time. From what I've seen, the terms on these types of loans are not out of line with the terms offered in other parts of the subprime market. But they are not horrible either. Whereas folks with a decent credit score might get 5%, these loans could range as high as 18% or more. Some people have had luck obtaining credit cards from retailers. This is not as easy as it once was when department stores were local establishments that were operated independently and not part of a multi-market chain, and carried their charge accounts in-house. First of all, there's nothing a credit repair agency can do that you can't do for yourself with the help of any number of web-based resources or books from Amazon. If incorrect or outdated information appears on your credit report, there are steps you can take to have it corrected. If the information on your credit report is negative, but still accurate, it cannot be permanently removed. Despite this, credit repair scams abound. They usually take advantage of the fact that a credit reporting agency will remove disputed information for a period of time while the dispute is being investigated. With the disputed negative information off the report, your credit history can look much cleaner than it should look. But, chances are, the information will reappear on your report when the investigation is complete. Credit repair agencies make their money by charging on-going fees, often by monthly subscription, to cover the successive disputes they employ to keep accurate, but negative, information out of your file. Here's the bottom line: It just takes time. Eventually, negative information will drop off of your credit report. The more and the faster you can replace those negative entries with new accounts that show you can pay your bills according to their terms, the higher your credit score will rise.